This time of year Brisbane residents dust off their heaters and dig out the electric blankets in readiness of the cold weather beginning, hoping to ward against the winter chill. But before you crank up the thermostat take a moment to check all off your winter appliances for wear and tear or damage which may have occurred during storage or gone unnoticed at the end of last winter. 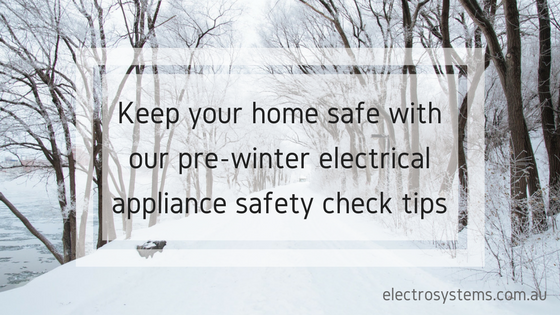 Important - Switch off and unplug the electrical appliance before carrying out your safety check. signs of insects or rodents activity - insects and rodents can eat or damage parts of the electrical systems and insulation which you can't easily see or access. Avoid using powerboards or double adaptors for heaters or electric blankets. If you don't have enough power points to plug in all your electrical items ask your electrician to install an extra outlet. Switch appliances off after use, before you go to bed or out of the house. Test and clean the smoke alarms in your home to ensure they'll activate quickly in the event of a fire. Keep flammable item such as curtains, blankets, drying clothing and linen at least 1 metre away from heaters or fireplaces at all times. Clean the lint filter on the clothes dryer everytime you use it. To ensure all your appliances and electrical systems are in safe working order ask your electrician for a complete electrical safety inspection. Your electrician's trained eye will pick up the little damages or issues most residents miss. Tip - Clean the reverse cycle air conditioner filters before switching over to the winter settings to help the system warm your home safely and efficiently. It's a good idea to check the Product Safety Australia website for recalled electrical products to make sure the appliances in your home are still safe to use. Here are just a few items commonly used during winter which have been recalled for safety reasons. Before you fire up the winter appliances give each item a check over for wear and tear or damage to keep your family and home safe this winter.